They say you look as young as you feel – but sometimes even a youthful spirit can’t stop facial fat pads from breaking down and migrating south. As we age, facial fat begins to feel the tug of gravity. When weaker skin laxity is added to the equation, it can often result in the appearance of sagging jowls. So when it comes to treating these sagging jowls, are over-the-counter creams and serums enough – or should you do a little more? The truth is, once sagging jowls appear, you’ll need a little extra help than what you can get at your local beauty store. Sagging jowls are best corrected by a traditional facelift procedure, as any non-surgical solutions aren’t going to produce the dramatic results you’ll be looking for. One of the main reasons that sagging jowls occur is because the facial muscles and skin have lost their youthful elasticity. A facelift procedure allows a plastic surgeon to correct this elasticity loss by repairing and rearranging facial muscles. Once the muscles have been repaired, the facial skin is pulled tighter, which helps alleviate the appearance of sagging skin. 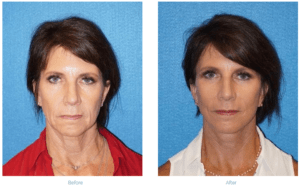 Not all facelifts are created equal – in fact, some candidates with sagging jowls may find their best relief from a lower facelift, which corrects sagging issues associated with the mid-to-lower regions of the face. Candidates with sagging around the jowls and the eyes may see their best results with a full facelift procedure. To learn more about the different types of facelift options and which procedure is best for reducing sagging jowls, schedule a consultation with board-certified plastic surgeon Dr. Rudy Coscia at his new plastic surgery practice in Granite Bay, CA. Dr.Coscia’s practice also serves the greater Roseville and Sacramento metro areas.